​Miguel Trinidad, Executive Chef/Owner of Maharlika Filipino Moderno, brings a new perspective to Filipino cuisine. With his Dominican heritage and New York upbringing, Chef Miguel understands that pushing Filipino food forward in the culinary spotlight means thinking outside the box. 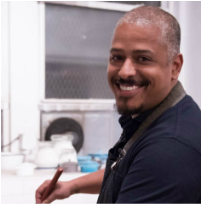 Formally trained at the Institute of Culinary Education, he was a “rookie” chef when tapped to be the Executive Chef at Soho hotspot, Lola. However, it is his 20+ years experience in the restaurant industry that has made him an integral member of Maharlika. He has worked in nearly every capacity of the restaurant and bar business ranging from bar back to maître ‘d. Miguel articulates that “food is living art and is constantly evolving” and keeps simplicity and quality as cornerstones of his cooking philosophy. “I like to keep the energy positive in the kitchen, it has an impact on the food,” says Miguel. Returning customers and rave media reviews are a testament to his dedication. Miguel honed his skill and love for Filipino cuisine on a three-month exploration across the island nation. His travels and his focus on Filipino food since 2007 has brought him credibility in the Filipino community. He met with notable Filipino chef, Claude Tayag, who inspired him in creating one of Maharlika’s critically acclaimed dishes, Sisig. The dish was featured in the New York Times, Timeout NY and The Huffington Post for its savory flavor and its distinct use of offal.